Because understanding your child is our highest priority...and our greatest strength! At Rectory, we know not all students learn the same way. Rectory’s supportive environment enables us to create a Personalized Learning Plan that fits your child. Our signature Individualized Instruction Program (IIP) allows students to build skills, develop executive functioning strategies, and gain the remediation and enrichment they need to thrive in a challenging academic program. 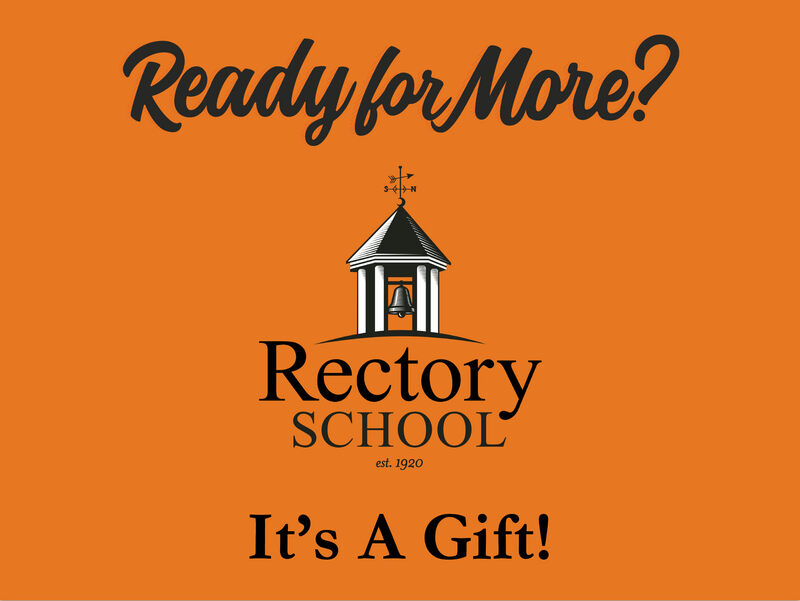 At Rectory, we build a foundation of core academic skills, create powerful learning experiences both inside and outside the classroom, and foster strong ethical and social values. The result is students who understand themselves and the world around them; students who are prepared for their next school and for life. "I think I can speak for every student when I say we all have done stuff we never saw ourselves doing before coming here. I tried chess, lacrosse, cross country, I even tried the play last year. Ever since moving into the double in Lower Memorial Dormitory last September, <Rectory> has brought me a step closer to knowing what being a man means. From learning how to manage my time to understanding it’s okay for males to express themselves. Without a doubt, Rectory has taught me how to look at the world through someone else’s lens." The heart and soul of the Rectory experience are our legendary faculty. By "legendary" we mean teachers who have a profound impact on the lives of their students, the kind of impact that lasts a lifetime, which is why alumni return to see their teachers and dorm parents year after year. We believe that young people learn best when surrounded by adults who believe they can succeed. We believe this so strongly, we've made it the cornerstone of our academic, athletic, extracurricular, and residential programs. Our signature Individualized Instruction Program (IIP) allows students to build skills, develop executive functioning strategies, and gain the remediation and enrichment they need to thrive in the overall academic program. When I first attended Rectory I was in the 1st percentile in reading, but over the next two years, my reading score rose to the 87th percentile and then to the 99th percentile. After too much time making excuses [for sending my child to boarding school] my response became this: "Don't ever say you would NEVER do something, because the very thing you said you would never do, could be the EXACT thing that your child needs." At Rectory we are student-centered. Students who are makers and doers are motivated to find not just the answer, but to ask, "Why?" Rectory students apply what they have learned to new and novel situations. They are the kinds of students who can identify a problem and develop an actionable solution. This High-Value Learning makes the classroom experience more compelling than teacher-centered approaches, and it takes the learning outside of the classroom. Rectory's March Experiential Learning Program (MELP) offers middle school students the opportunity to develop the courage to explore new experiences and new adventures. This innovative program encourages all students to thrive in a compelling hands-on environment where the emphasis is on teamwork and creative problem solving. We work hard to foster a community built on mutual and unwavering acceptance for one another. And while we set an expectation that this level of acceptance will exist at the core of the Rectory Community, we understand that, with elementary and middle school children, there will be moments when students fall short. These are the moments when we work even harder-- encouraging our students to dig deep and practice responsibility, respect, honesty, and compassion. These are the moments that build strength of character. These moments result in the sincere respect our students have for one another that make our community feel less like a school and more like a family. Our approach at Rectory is to ensure that all students are understood, challenged, and encouraged-- not just academically and socially, but personally. As a result, we witness great outcomes. Academic skills are important to be successful in secondary school. Academic skills combined with confidence prepares students for life. This confidence comes from overcoming challenges, from working through tough issues, and from true growth. It comes from feedback from adults who are paying attention and have the best interest of students in mind. Alumni often reflect on the impact Rectory made on them, often in ways they couldn't even imagine when there were students. The impact of the Rectory experience is so profound, it lasts a lifetime.